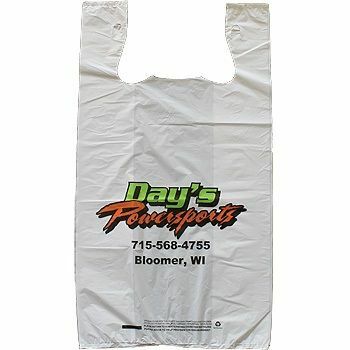 Leave a long-lasting, unforgettable impression on your customers with the new, Personalized T-Shirt Bags that are robust in nature to carry the load of your groceries while the ample space allows you to stock up your grocery items inside. 10 X 6 X 18"
Personalized T-Shirt Bags are available in six different yet charmingly exciting shades and are equipped with strong, stout handles that allow an easy portability. Whether it is some light weight items or your heavy grocery stock, there is ample room for all such items inside the bags which are hard-wearing enough to withstand the rough expectations of your customer. Why should packaging be a redundant part of the shopping when it can be this striking and convenient without costing your customers a fortune? Personalized T-Shirt Bags are available in six different shades to add to the arty magnetism.